Home > Blog > Uncategorized > GMP Standards vs. GLP Standards: What Are the Differences in Lab Testing? 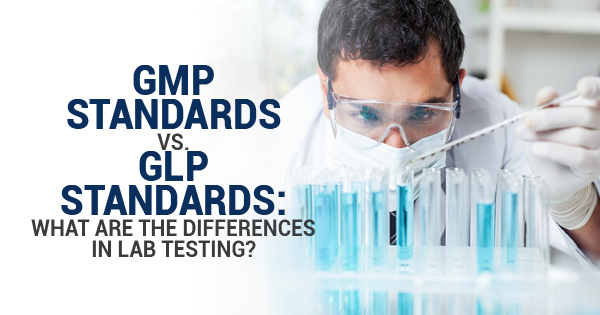 GMP Standards vs. GLP Standards: What Are the Differences in Lab Testing? Laboratory testing protocols are in place to make sure lab settings are safe and follow the rules. This is especially true in the U.S., which is the largest national producer of chemical products around the world. But when it comes to laboratory testing, people often get confused by differences between Good Laboratory Practices (GLP) regulations and Good Manufacturing Practices (GMP) regulations. While similar, they do serve different purposes, so let’s take a look at a few key differences between GMP and GLP regulations. In general, GMPs are in place to show the FDA whether or not certain products are manufactured under the proper manufacturing criteria. GMP quality assurance looks at the overall process of how products are manufactured. So when it comes to the facility the products are manufactured in, GMPs look at things like lighting, plumbing, washing requirements, and GMP storage conditions along with separate areas for using certain substances that can’t be mixed. Additionally, any equipment used in the facility must meet the qualifications for use in the manufacturing processes that are being used. And when it comes to approving or rejecting procedures, A GMP Quality Control Unit has the authority to make the final decision. Overall, Good Manufacturing Practices for Active Pharmaceutical Ingredients (API GMP) regulations are in place to ensure pre-defined manufacturing criteria are met before products are released. GLP testing regulations are in place to ensure scientific data integrity is being protected. In doing this, the EPA or FDA is provided with clear data and records regarding research that’s being done. Similarly to a GMP Quality Assurance Unit, the GLP Quality Assurance Unit is responsible for inspecting essential phases of studies in order to ensure the research is in compliance with GLPs. In general, anything that has to do with safety testing or efficacy testing regarding open-ended research is regulated under Good Laboratory Practices. So while GMPs and GLPs work hand in hand, they overlook different areas when it comes to lab testing. And because of these differences, both types of standards are required to ensure the overall lab testing setting is safe and effective during research.